Flourish Trace™ supplies a broad range of trace elements demonstrated to be necessary for proper plant health and growth (see below for signs of deficiencies). Trace elements are normally depleted by utilization, oxidation and precipitation. The latter two processes occur more rapidly than with other micronutrients. This makes it important to restore trace elements on a regular basis. 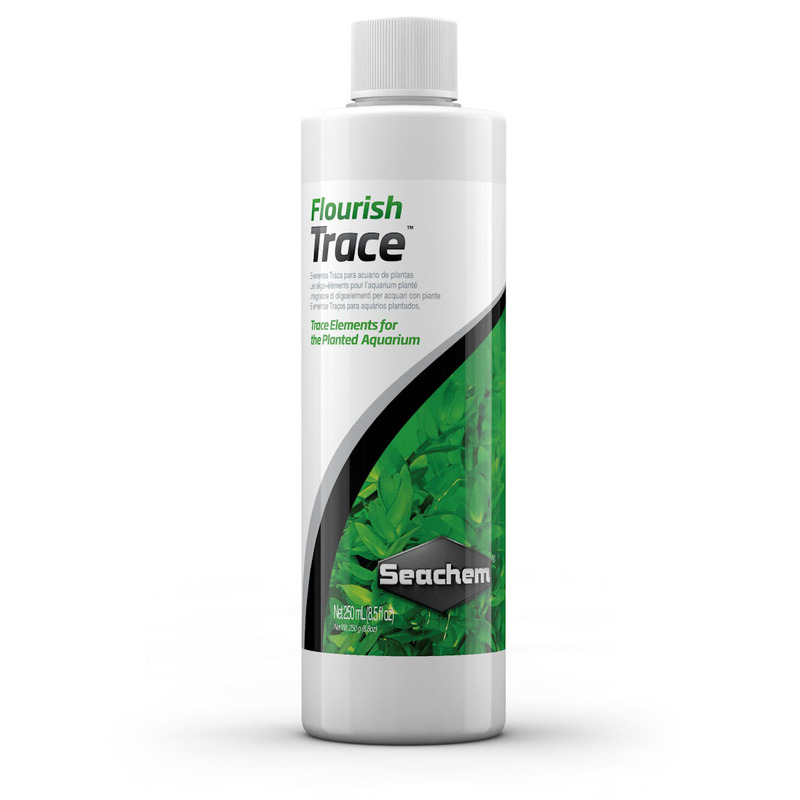 Flourish Trace™ may be used alone or in conjunction with Flourish®. Best results are obtained when both are used. Flourish Trace™ is safe for invertebrates such as shrimp. Use 1 capful (5 mL) for every 80 L (20 US gallons) twice a week. When using in conjunction with Flourish®, dose on alternate days. Q: Will the recommended dosages of Flourish Trace cause an increase in general water hardness? A: Because the elements are in trace amounts, they should not increase your general hardness. The trace elements in Flourish Trace are either utilized, oxidized or precipitated from solution. Q: Under what circumstances would I use Flourish Trace if I'm already using Flourish? A: Flourish Trace is a supplement based on the National Academy of Sciences findings that certain trace/ultra-trace minerals are necessary for development of plant life. These trace/ultra-trace minerals are rapidly consumed and depleted through chemical means, some in mere hours. Flourish is an organically based supplement. The use of Flourish Trace will give you a way to dose back these trace/ultra-trace minerals without doubling up on the organics found in Flourish. I would use them preferably on alternate days to keep a constant influx of these trace/ultra-trace minerals available to your plants. A: Flourish Trace can be used daily. It is probably not necessary unless you have lush plant growth in your aquarium. If your aquarium is sparsely planted, using this product daily will be wasteful.